voice for economic growth for District 22 in the Florida House. The Joe Harding Campaign today announced the endorsement of Commissioner Matt Brooks, Vice Chair of the Levy County Commission. 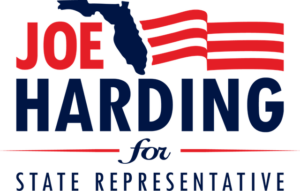 Harding, a conservative Republican and seventh generation Floridian who was born and raised in Williston, announced his candidacy for the District 22 seat in the Florida House of Representatives in February. The seat is currently held by Representative Charlie Stone, who will not be seeking reelection in 2020 due to term limits. Brooks was elected to the District 5 seat on the Levy County Commission in 2016 and currently serves as Vice Chair. He is a U.S. Army veteran and the owner of three businesses, Vision Quest in Charleston, South Carolina, and B4 Signs and Advertising and Shed Masters in Williston. Prior to that, he was Director of Marketing and Public Relations at Push America, a nonprofit organization that raised money and awareness for people with disabilities.